I'm fighting a nasty cold, too much work, and no sleep and my head is in a fog, which would have led to a really strange blog post today (one that might involve The Baby, no diaper, poo, my computer chair, and finger painting). So it's times like this that Chuck comes to my rescue and makes me giggle. Chuck Norris reads PamperingBeki blog. Really! Look at the first comment. Chuck is always first. Chuck Norris can cure the common cold. LOL this post is hilarious! 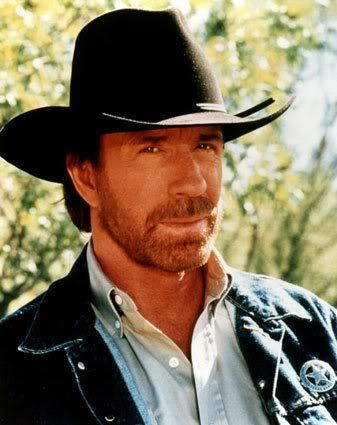 Honestly, I really despised his show, walker texas ranger. He and Horatio from CSI: Miami can do anything it seems. The invincible red-headed crime fighters. I am going to have my son read this. He is a Chuck Norris fan or should I say Chuck-a-addict. Great post! LOL!! That cracked me up! And, I used to love the show as a kid! LOL--can't wait to share these with my son, he is all about Chuck NOrris these days! I think I'll print them off and drop them on him little by little! Pure Blog Gold!! This was hysterical. Are you always this funny when you are sick? Feel better soon and have a great weekend.